MS is going to add many features to its client-side scripting libraries, further imitating the features of libraries like jQuery. CSS DOM selectors, Chainable DOM generation, and CSS-based event targeting are all proposed enhancements. MS is going to build client-side data source controls (!) to enable complete client-side data operations. The controls will have corresponding server controls for easy setup. This obviously isn't everything from the 13-page road map, but rather a Reader's Digest version. On the surface, Microsoft's goals look ambitious, but they certainly sound like they'll benefit the ASP.NET developer community if met. 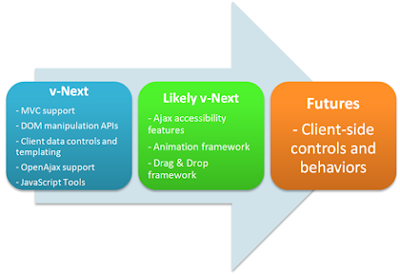 And while most of the plans in the new road map represent v-Next ambitions, Microsoft isn't aiming to deliver everything covered ASP.NET AJAX v-Next. The following chart summarizes Microsoft's high-level release goals. You can see that the client-side UI controls are "last" on the list right now, and everything is at least "likely" to make v-Next. As a component vendor, I find it interesting that Microsoft is choosing to wade-in more heavily to what has traditionally be a 3rd party supplied UI market. While 3rd parties like Telerik will leverage their agility and close relationship with customers to always build richer, higher performance, and more complete UI controls than Microsoft, you can never ignore a move like this that creates a "free option" from the creator of the framework. Time will tell if this is a good move for Microsoft or not. In the mean time, what do you think? Should Microsoft try to deliver more advanced controls like client-side Grids and Treeviews or should they leave that to 3rd parties? 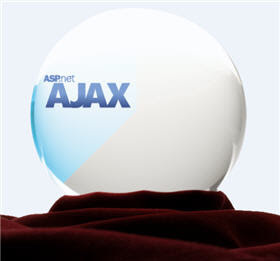 Also, what do you think of Microsoft's ambitious plans for ASP.NET AJAX? Sound-off in the comments and don't forget to give Microsoft some feedback, too! Am getting so fed up of MS approach to the web. They are constantly playing catch up but insist on rewriting everything. And it's funny because we're on version 3.5 of .net and they still don't can't write a asp.net radio button that works properly in a repeater! @Anders- Yikes! I thought you still wanted to get good controls on a frequent (and regular) update cycle. @Pete- I hear ya. Let it out- it's good for the programmer soul. I will add that I think MS is doing a much better job with its new development in building platforms that "play nice" with other technologies (like PHP, Ruby, etc. ), but I guess it is all relative. Hopefully we can look forward to more improvement in the future. Yes Todd - and Telerik do provide that. Hence my winked-smiley-face; But the fact is, that when it's MS - it becomes a standard. Even if it's a mediocre solution (e.g. checkout the whole ADO EF discussion). That said - one of the advantage of the AJAX Control Toolkit - is that they can be used JS only; No need for ASPX markup, so they can be created dynamically byJS only..
Btw - on another node: I'm a (was) bit confused about the planed releases - but I just saw that the roadmap (for the ASP.NET AJAX) has been updated. I presume that the ASP.NET controls are (still) your flagship? In that case I'd personally like to see more blogging on that front - because you really stand out hefty with that product line (ALL the controls and skins). Thanks for your summary and your thoughts. I always appreciated Microsoft's strategy to provide basic functionality in form of shipped controls and components. More sophisticated controls should be deployed by 3rd parties (when they are better). @Björn- I agree that the framework should be improved. In fact, I'm a big fan of most of the proposed changes, especially the client-side data source (don't confuse it with an offline-data source like Google Gears) and the proposed improvements in the client-side libraries.